The Admor of Malta is hosting over 90 distinguished guests – from scholars, to spiritual leaders, diplomats, former heads of state, professionals and other international authorities – who will travel from all the continents to receive the latest teachings in universal spirituality. 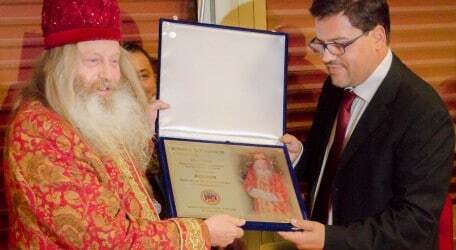 The Admor is the Chief Rabbi of Malta, a world renowned spiritual leader and a scholar of Jewish Kaballah. He is the founder and Grand Master of the United Order of Light, an international organisation made up of people of different religions who come from scientific, academic, economic and financial backgrounds from all over the world, with the mission to supersede religious boundaries and to sustain humanity for the common good, overcoming the restrictions of religion and race. After travelling the world, since five years, the Admor – as he is affectionately referred to by his followers – has chosen Malta as his base. This is the third gala gathering the Admor is organising in Malta, which will be held at Palazzo Parisio on December 3. Speakers at the event include Prof. Louis Buhagiar, Prof. Richard England, Leonardo da Vinci prize-winner Prof. Gerardo Iovane from the University of Salerno, and Argentina’s Rabbi Yosi Baumgarten. Known for keeping a low profile, the Admor of Malta is sought after by people from all walks of life to benefit from his spirituality. In recognition of his work in the world, which transcends all religions and cultures, he was recently awarded by the University of Salerno for his intervention on the ethics of finance. For more information about the Admor of Malta, a website will be launched at the December 3 event www.admorofmalta.org.